Established in 2014, Caring Hearts and Hands LLC is a provider of non-medical home care services in Newport News and Kilmarnock, Virginia as well as its surrounding areas. At Caring Hearts and Hands LLC, we are focused on providing high-quality in-home care services with the highest level of customer satisfaction, and we will do everything we can to meet your expectations. With a variety of offerings to choose from, we’re sure you’ll be happy working with us. We are a trusted provider of services tailored to meet our client’s needs. All caregivers undergo thorough interviewing, testing, and screening prior to employment to ensure the highest service standards will be met. We are licensed, insured and bonded. We are available 24-hours a day. We are committed to providing high-quality, client-centered and affordable home care services to our clients to assist them to lead dignified and independent lives in the comfort and safety of their own homes. I am a graduate of Lancaster High School in Lancaster, Va. I also attended Strayer University for two years where I studied Business Management. Taking care of others has always been my passion. Seeing a smile on the faces of my clients means everything to me. On a daily basis, I oversee all contact between clients, employees and referral sources. I also manage client medical records, oversee the client satisfaction and coordination of client services. I have worked in the healthcare field for over 15 years in a variety of settings. 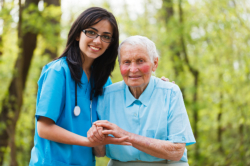 We are always ready to provide our home care services whenever you need them. Please call us at 757-873-4000.